Stanford Professor John Ousterhout is known for his profound life lessons. I stumbled upon a post on Quora where Prof. Ousterhout explains that A little bit of slope makes up for a lot of y-intercept. This life lesson particularly rings true for startup valuations. If you start a company for the right reasons, you should care more about the slope (growth) rather than the y-intercept (first valuation). You’re more likely to build a successful company if you can start building immediately, rather than delaying in raising capital, waiting for the best available terms. From my experience, very early stage startups have trouble raising capital because of unrealistic expectations of the value of their company today. This handcuffs a company because its drags out the time it takes to raise capital. Thousands of companies exist in the business plan/beta product stage. Institutional Investors aren’t combing through this haystack to find the diamond encrusted needle; making fundraising time consuming and distracting. If you have the next multi-million dollar idea, your top priority should be to spend 100% of your time building a MVP. Raising capital quickly is one factor that determines if a company will be successful or not. In my last blog post, I offered a solution to raising capital quickly: give favorable terms to your earliest investors. 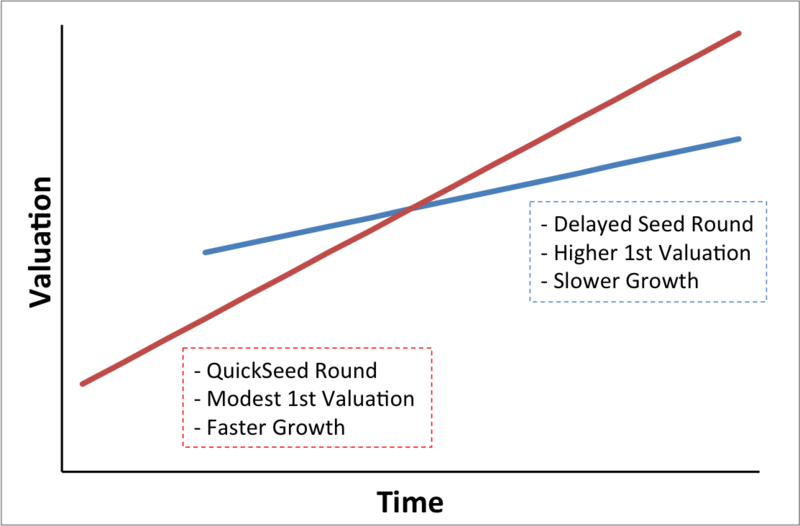 Here are reasons why raising seed capital quickly, makes your company more valuable in the future. You have a small window of opportunity to get an MVP to market before a competitor beats you to it. You have a higher probability of success if you have a first mover advantage. Personally, you have a finite amount of time where you can take no salary and risk your career building a company. The faster you can build an MVP, the further you can see your idea through. You’ll be closer to an institutional round of funding. Investment dollars are attracted to companies with traction. If you can show 3-6 months of 30% m-o-m user growth, revenue or downloads, you’ll attract the attention of Angel Groups and Seed Stage VCs. Raising capital quickly by offering good terms to your early investors, gives you a higher chance of success. If you’re successful, you’ll make money regardless of the terms of your first round.